Ruth Trail leads a double life, working as a spy or informant for the London police while secretly executing her own black deeds of theft and murder. Over the course of the unflagging, action-packed 1100-page plot, we follow Ruth’s criminal career as she uses her wits and beauty to gain wealth and power. Along the way, as we pass through the horrors of prisons, convents, and the criminal underworld, we meet a cast of memorable characters, including the murderous ruffian Death’s Head, escaped convict Jack Rafferty, the sinister schemer Eneas Earthworm and his victim Alice Trevellyan, wrongly accused as a murderess, the bumbling but charming Captain Charley Crockford, and the unlucky Cadbury Kid. 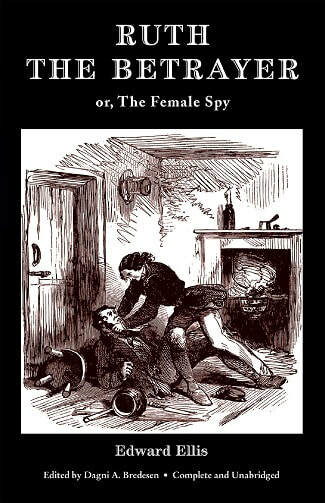 Originally published in weekly installments in 1862-63, Ruth the Betrayer; or, The Female Spy returns to print at last in this new edition, which includes an introduction and annotations by Dagni A. Bredesen, all 51 illustrations from the original edition, and an appendix featuring additional contextual material.